Jerry Seinfeld will be the first guest co-host on ‘Live! With Kelly’ when the show switches to a Regis Philbin-less format. Philbin leaves ‘Live! With Regis and Kelly’ on Fri., Nov. 18 and the show will transition to ‘Live! With Kelly’ as it searches for a permanent co-host. A similar format was followed when Kathie Lee Gifford left the series in 2000. 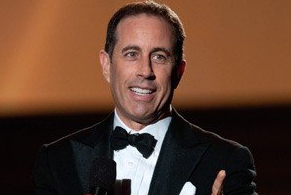 Seinfeld will guest co-host from Mon., Nov. 21 – Wed., Nov. 23. Jason Segal, Kim Cattrall, Howie Mandel, Jamie Oliver and Miss Piggy are scheduled to stop by ‘Live!’ while Seinfeld is co-hosting with Kelly Ripa. Philbin is leaving the show after 28 years. However, he’s not retiring. The 80-year-old host recently called a radio show to set the record straight. If he’s not retiring, then why is Philbin leaving ‘Live!’? Philbin hinted it was over contract troubles.